In addition to the audio version, Akira has also made a YouTube version complete with Anime Music Videos, because, and I quote, he is "on some next level sh*t."
The Don's been a favorite here at ComicsAlliance for a while; his last album, The Life Equation, was at least partially inspired by the events of DC's Final Crisis and featured rapping about Darkseid and the New Gods, so it's pretty safe to say that it's right up our collective alley. I might not be the anime fan that I once ways in my wayward youth, but I'm not going to lie, his use of beats from Ninja Scroll and Fist of the North Star took me right back to a time when I was making regrettable purchases of second-generation Galaxy Express 999 fansubs on VHS from the flea market. You kids today don't know how good you have it. The Album: I loved anime ever since I saw Akira when I was 10 or 11. I remember seeing the advert for it in the back of my Dad's copy of Vox magazine and just being enthralled. I was at the time into Marvel comics, and had been since I was 6 or something, but there was something about the artwork on this advert that was just transcendental. After I was Akira I became somewhat obsessed, and then the weirdest thing happened: an anime distribution company and accompanying SHOP called Anime Projects opened up down the road from my school. Now this is weird, because I grew up around Bangor in North Wales, which is tiny, and didn't even have a McDonalds or anything like that, and certainly nothing like a comic shop -- there wasn't one of those for over 100 miles -- so that this anime shop just magically appeared like something in a Terry Pratchett book was insane. So me and my little group of friend used to go down there every day after school and annoy the owners, and occasional we'd buy video cassettes of Anime Projects and Manga Entertainment releases and take them to whichever of us had the most tolerant parents (not me) and freak out. Like, woah! Robots! Gods! Aliens! T*ts! Swearing! AMAZING METAPHYSICAL AND EXISTENTIAL CONCEPTS WE CAN BARELY GRASP! It was an amazing education. Track 2: Fist of the North Star: FOTNS is definitely one of my favourites on the mixtape. It started out as a bootleg of that Heart of Madness music from the OG movie with Method Man's PLO Style, in which he memorably rapped "I'm the true fist of the north staaaaaar!" However, when I sat down and listened to the thing, I was jealous of Method Man getting to rap on it, so I cut his verses off, made the beat 10 times harder, added some synths, and rapped the hell out of it. I spoke about quite a lot of stuff I'd never mentioned before on this tape for no good reason I can think of other than that the nostalgia created by the music made me think of times past... but either way, on this song I talked a little about leaving home the day before my 16th birthday and getting kicked out of my nan's and selling drugs and stuff that for the first time felt right to mention. Fist of The North star itself is just pretty much the most badass movie ever. It's the Chuck Norris meme on powdered Chuck Norris crack being snorted by GOD. Dude can make people EXPLODE just by POKING them. I was about 12 when me and my friends watched this, and the violence that ensued, and continued throughout the school year as a direct result was ridiculous. Basically if you heard anyone going"didididididid!" you had to RUN LIKE HELL... That bit where he creates a whirpool in the fat guy's belly will stay with us all forever. Ghost In The Shell itself is obviously one of the greatest movies of all time. I saw it before the Matrix which ruined the Matrix a bit for me as it takes so much of it... it's lucky I hadn't read The Invisibles yet or it might have been entirely unwatchable. Anyway, Ghost in the Shell's theme music is incredible haunting, weird stuff, and the stupidest thing you could do is try and out a chorus on it. I wasn't even going to have any rapping on it, massive bass and 808s and scratching, but my DJ Jack Nimble was grabbed by extreme inspiration when he heard it when he came round to do the scratches, and wrote his awesome dystopian verse in about 10 minutes. Track 9: Akira: AKIRA is something I have always had as a sampled beat, and something I have always refrained from recording, because it was so special to me, and I didn't think I deserved it yet. I had to get to a certain level of skill before I would allow myself to touch it in that way. Akira was a monumentally important thing in my development as a human. I watched when I was 10 or 11, and it basically confirmed everything I felt and thought about the way the world worked. As I say in the song, it elocuted things that I still can't say. Now, Big Narstie told me a similar story, but what it did for him was sort of visualise the intense rage he felt inside as a little boy. He used to jump off roofs and punch people in the face and stuff when he was that age. So I got him on the song, and he acts as this sort of insane, physical roaring foil to my more contemplative, cerebral take on the thing. Track 10: Ninja Scroll: A lot of the songs were the results of me creating a shortlist of movies I wanted to sample, then getting my rap friends over, wherupon we would blaze a zoot, and choose a song. I would then chop up the song and make the beat on the spot, while whoever was round would write their verse. Big Narstie's favourite anime is Ninja Scroll, and we went though the whole soundtrack before getting to the end credits, and as soon as that first piano hit dropped we looked at each other like, YES, that is THE ONE, and without even saying anything he started rapping and I looped it up and played some bass and drums and stuff. Track 12: Dominion Tank Police: In the same manner we did Dominion Tank police, which was Marvin the Martian's choice, and I got to rap about stomping concrete blocks in a mecha suit with angels in hot pursuit. It was also a fortunate coincidence that "mecha suit" rhymes so well with "make a zoot". 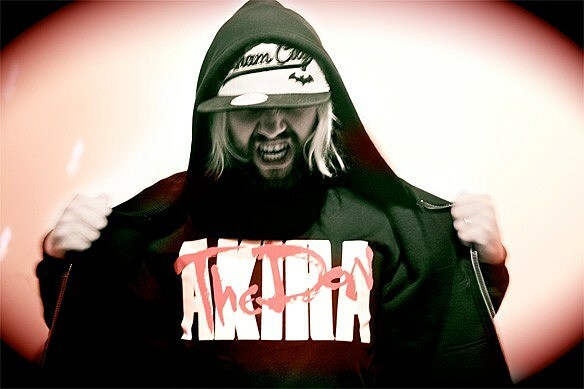 To download the album and check out the t-shirt and hoodie being modeled above by the Don himself in all his Tetsuoesque fury, hit up AkiraTheDon.com!